The leaders of Paterson public school district and local charter schools, in a rare and unexpected show of unity, joined forces in a rally on Wednesday afternoon to call on governor Phil Murphy’s administration to provide more education funding to the city. Representatives from five of six charter schools attended the rally at the Paterson Charter School for Science and Technology’s high school campus on West Railway Avenue, three blocks from the Paterson Public Schools headquarters. Superintendent Eileen Shafer, who repeatedly lambasted charter schools over the past month for taking away millions of dollars from the school district, forcing her to potentially layoff 200 staff members, joined the charter leaders. 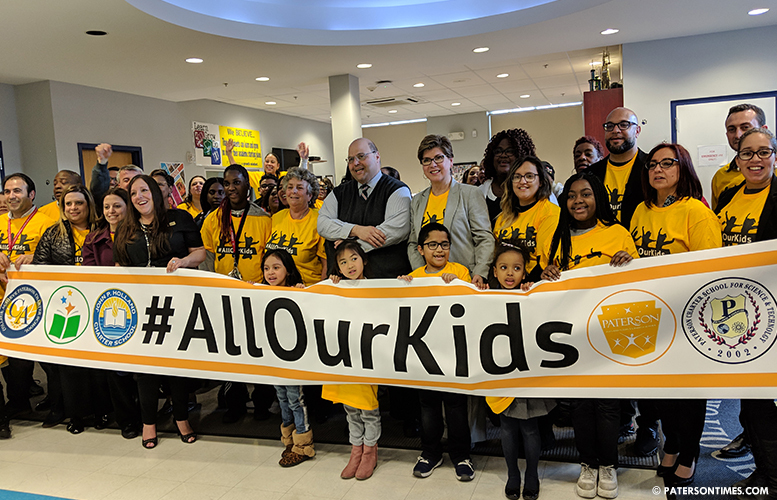 Clad in a bright yellow shirt, emblazoned in front “#AllOurKids,” distributed by a charter school group, Shafer said she supports the intent of the state’s charter school law. Shafer’s criticism left charter school leaders fuming. Some wanted to sign up hundreds of parents to crash a school board meeting as a response to Shafer’s criticism, but local leaders intervened. Instead both sides agreed to host a unity rally. “We’ve all agreed to advocate collectively on behalf of Paterson’s kids,” said Robert Guarasci, head of the Paterson Charter School Roundtable, a group that represents the city’s six charter schools. Shafer denied criticizing the charter schools after the rally. “I did not criticize the charter schools. I said they need to find a better way to fund the charter schools and the public schools,” said Shafer. Shafer received applause at the board meeting in March for taking aim at charter schools. Her criticism came at a time half of the city’s charter schools had been dealing with sexual harassment allegations against some of their leaders. “They are taking the money from our school district, giving everything charter schools need, and our children are left with the minimum that doesn’t provide a thorough and efficient education,” Shafer said at a March meeting. “Now, I think it’s accomplished that we’re all on the same page,” said Gurcanli after the rally. The district received $13.23 million more in state aid for the next school year, but much of it will be sent to charter schools. School officials said $63.8 million will go towards charter schools, up $9.42 million from the last budget year. Shafer faced a $22 million budget gap. Her staff balanced the preliminary budget by cutting 232 jobs and eliminate programs put in place last year to improve academics in the district. Keisha Smith, a parent, said she was disheartened by the “us versus them rhetoric,” but was happy to see officials from the district and charter schools in the same room. “It makes me very proud and happy to see all of you here. It gives me hope for all of the children that are in the city,” said Smith. She has two children — 8th and 10th graders – enrolled in the Paterson Charter School for Science and Technology. Smith was among 50 people to attend the rally. State senator Nellie Pou and assemblywoman Shavonda Sumter also attended the gathering. Ha. Shafer fell in line after getting squeezed by the party. So much for being no-nonsense and tough on charters. yes I am very disappointed she backtracked…probably because the BOE and dems are in the charter's pocket and they threatened to fire or not renew her contract. No public money should go to charters, yeshivas or religious schools, especially to ones that deny the Armenian holocaust like the Paterson Arts and Science Charter Schools. Let's not call names. It shows a lack of cogent argument. Pou has constantly voted against the best interests of her constituents in order to gain financially from their misery. Wrong. She decided to not to given in to NJEA/PEA's mafia style tactics. For people indicating that charters are bad. Read up on your information. We are part of the school district. Please get informed. Charter school are public school as well, only difference is we function in a more efficient manner. As a mother with her children in the Longest running charter school. I would not change it for the world. I actually would of love her her to emit a retraction from her previous words. Because we are not taking anything that isn't rightfully ours. For those who dont know here is a little knowledge. We do more with less money. Charters in Paterson receive about 85.5% of the district’s per-pupil funding ($13,985 vs $18,360). o These figures exclude hundreds of millions of dollars in facilities construction and debt service aid provided to Paterson City by the SDA, its predecessor the SCC, and the State that we do not receive..Even though that is not shared. We have to Unite. Regardless if Charter or regular public. We should as in this news article all be 1 Paterson. "We are part of the school district. Please get informed." No you're not. You need to do research and get your facts straight. Paterson Board of Education has no control over charters. You forgot the fact half the schools have perverts at their helm as stated in this story. Not a good look. I wouldn't send my dog to those schools run by pervs with no real board of trustees to hold administrators accountable. I know for a Fact that you are mistaken! The Facts will come to light. There's nothing to come to light. The Board of Education doesn't run charter schools. Each Charter got their own Board of Trustees. Charter schools are private entities either backed by Wall street or in the case of Paterson Science the terrorist Gulenist movement, not public schools. They siphon off funds like a parasite create a seperate and unequal system that smacks of pre-1954 Brown v Board of Ed. The directors are rife with nepotism and cronyism many time hiring fired admins/teachers(McNair) , sexual deviants (Manny martinez, McNair, Danny Necimo) , there is vendor scandals where bill pumping and kickbacks are the norm, the abuse of h1B visas , the attrition scam, no background checks, denial of the Armenian Holocaust etc. It is a money making scam…CHARTERS ARE THE REASON FOR THE BUDGET SHORTFALL. CLose the charters, problem solved…The truth HAS come out, charters are not better, they just cook the books and use smoke and mirrors to provide a false illusion. Where exactly would Paterson Board of Education put all the students that are in the charter schools? As it is they have classrooms reaching 40+ students. Get your facts straight Charters are not backed up by Wall Street. Don’t make me laugh. You are very delusional in thinking that CHARTERS ARE THE REASON FOR THE BUDGET SHORTFALL. I know this for a fact! But it’s a fools task to try and convince people of the likes of you. May 20, 2014 – ..
Oct 1, 2015 – While the New York Times seems determined to promote charter … Despite Big Problems Charters Attract Hedge Fund Support and … Washington Education Association is a union representing Washington state teachers. May 17, 2016 – This post originally appeared at American Prospect. … The hedge-fund industry and the charter movement are almost inextricably entangled. ….. Jokes on you! None of those articles are about Paterson! Jokes on you Charters are national networks funded by either Wall Street or the Gulenists. Where ever there are charters the SAME PROBLEMS OCCUR. Their wretched tentacles stretch everywhere INCLUDING PATERSON! Again If charters are so great why dont the neighboring suburban towns clamor for them?? Why did Clifton say hell no we wont pay? Because these cancerous parasitic charters profit off people of color using lies, smoke and mirrors. Question…If charters are so great why arent other towns clamoring for them ? Why do they target only black and brown towns? Because charters only exist in under privileged communities. Duh! duh, because if they were so great as you say, white towns would clamor for them, in really they exploit underprivileged areas for their own profit..do you really think some Wall Street fat cats care about kids in the hood? No its part of a larger plan to destroy public education for their own profit…Betsy De Vos loves charters need I say more? If charters are so great why arent other towns clamoring for them? Why did Clifton say no? Did they taken over by the state Oshin "clueless" Castillo? How is it that Manny Martinez voting for his own charter's expansion is not a conflict of interest? I think Paterson residents who are teachers should be able to run for the BOE then…at least they get fired if found guilty of sexually accosting someone..
Open to all students from the charter school's district or region of residence on a space-available basis. Free. They cannot charge tuition. A charter school operates under a charter granted by the Commissioner of Education and is independent of the local school district's board of education. It is governed by an independent board of trustees. Establish new professional opportunities for teachers. Founders of a charter school can be teaching staff members, parents with children attending schools in the district or a combination of both. Founders can also include institutions of higher education or private entities located within the state in conjunction with teaching staff members and parents. As of September 2016, there are 88 charter schools currently operating in New Jersey. As of October 2016, there are approximately 46,000 students enrolled in public charter schools across the state.